22, Jalan Gandek, Off Jalan San Peng, 55200 Kuala Lumpur, Malaysia. 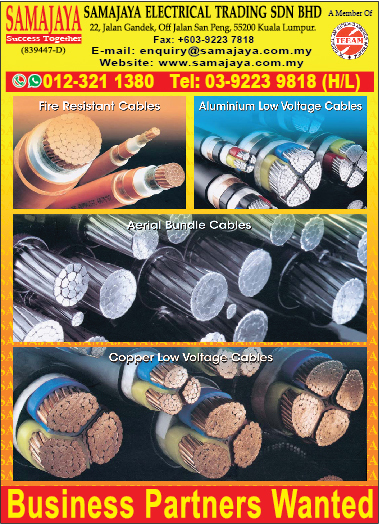 We are an established "ONE STOP " specialized Electrical Supplier since 2003. SAMAJAYA serves a remarkable array of esteemed contractors, dealers, switchboard makers & building maintenance operators. 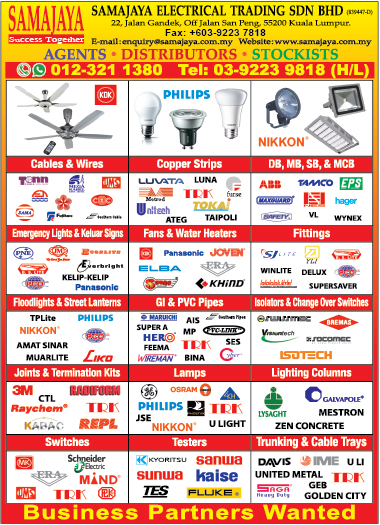 Our products included Cables & Wires, Copper Strips, DB,MB,SB & MCB, Emergency Lights & Keluar Signs, Fans & Water Heaters, Fittings, Floodlights & Street Lanterns, GI & PVC Pipes, Isolators & Change Over Switches, Joints & Termination Kits, Lamps, Lighting Columns, Switches,Testers & Trunking & Cable Trays & etc. SAMAJAYA is poised for sustainable growth, building on the strong foundation established. We will continue to expand through "BUILDING ENTREPRENEURS " throughout Malaysia.